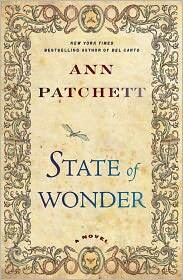 Most of Ann Patchett's new book, State of Wonder, takes place in the darkest reaches of the Brazilian jungle, but it starts out in a very different place-the frozen Minnesota prairie. Marina Singh, a research scientist who works for a pharmaceutical company in Eden Prairie (a name so aptly chosen you might think Patchett made it up), is dispatched to Brazil to track down her former mentor, Dr. Annick Swenson. The domineering Dr. Swenson is developing a fertility drug for the company and has gone off the grid and maybe a little off her rocker.? Marina also hopes to find out what happened to her colleague, Anders Eckman, who preceded Marina in the quest to find Swenson, but has apparently died in the effort. In contrast to her cold, well-ordered Minnesota life, Marina arrives in a steaming jungle teeming with fertility and where the opaque and muddy Amazon hides danger beneath the surface, anacondas, for example. What ensues is a feverish tropical stew of places, people, and ideas that bring to mind other works of literature. Patchett clearly patterned State of Wonder on Joseph Conrad's Heart of Darkness in which Marlowe goes into the heart of the Congo in search of Kurtz the ivory station master. The story occasionally evokes H.G. Wells' The Island of Dr. Moreau, with a dash of Avatar thrown in. What all of these have in common is the cultural, ethical, and physical impact outsiders have on native cultures. Patchett previously explored the idea of people adapting to an exotic and threatening environment in her best-seller, Bel Canto. Several aspects of the story require the reader to suspend disbelief, first and foremost a pharmaceutical company that continues to fund a research operation for years with no results and a researcher who is totally incommunicado. Really? And would women honestly want a drug that kept them fertile forever while their bodies aged? Says Eckman, “Imagine someone offering you the equivalent of 'Lost Horizon' for American ovaries.” If this female fountain of youth applied to the whole body, there'd be no end to the demand, but just the ovaries? Doubtful. In addition, the pacing of the story is uneven. It takes half the book for Marina to arrive at the research station but most of the action takes place at the very end. Marina filled her lungs with frozen air and smelled both winter and spring, dirt and leftover snow with the smallest undercurrent of something green.? That was another thing she and Anders had in common: they were both profoundly suited for Minnesota.? She wanted to develop a fear of flying that would keep her from every going farther than the Dakotas in her car.? Like her mother and all her mother's people before her, those inexhaustible blonds who stakes their claim in verdant prairies, Marina was cut from Minnesota, the soil and the starry night. Writer, editor, reader, traveler. Not necessarily in that order. It’s a relief to know I’m not alone in having some issues with this book. Mine started with some problems with the Eden Prairie setting (where I live), and then it all went downhill from there.